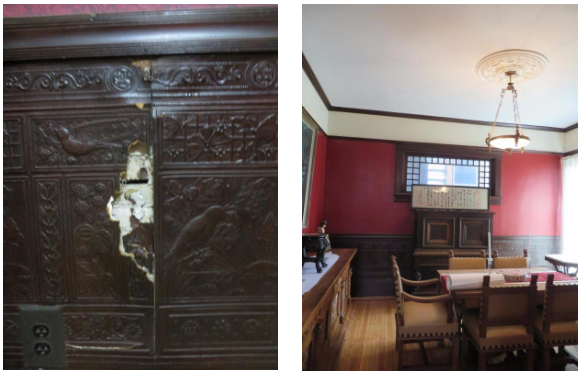 When working with homeowners to repair or restore their house, Heritage Home Program staff often suggests historic materials that may not be available at big box hardware stores. We attempt to stay in touch with local distributors and specialty contractors to source construction materials that are appropriate for older homes. We always keep our ear to the ground for reclaimed, or newly manufactured materials that can be substituted for the old. 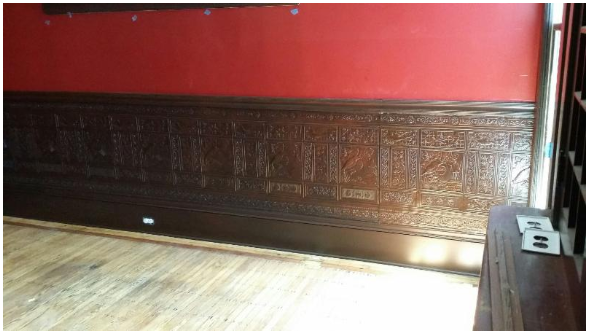 Below is an example of a specialty wallpaper manufactured by Lincrusta. Lincrusta is an embossed wallpaper that can look like leather. Heritage staff identified this special paper on an initial site visit and the homeowner was put in touch with a specialist. The tradesperson was able to identify the pattern name and years it was produced (1885-1900). The wall paper specialist then successfully restored the damaged areas, keeping an integral part of the interior architecture of the house.